Roland’s new XI-Dante expansion interface card. Los Angeles, CA, June 11, 2015 — Roland Pro A/V announces the availability of XI-Dante, an XI-Expansion Interface card that extends the audio I/O capabilities of the M-5000 Live Sound Mixing Console. The new XI-Dante is one of seven expansion cards offered as part of the open architecture of the O.H.R.C.A. mixing platform found in the Roland M-5000. The XI-Dante card future-proofs the M-5000 by enabling it to interoperate with the growing number of manufacturers’ products that are Dante™ compatible. 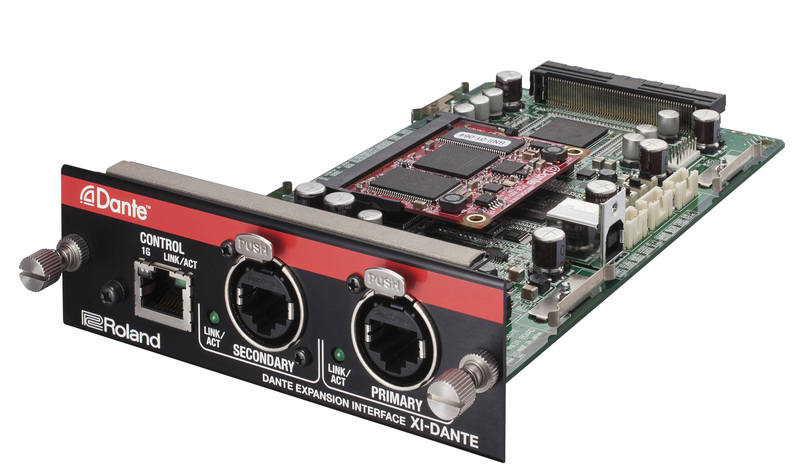 Photo caption: Roland’s new XI-Dante expansion interface card.